Here are some work-in-progress shots of a recent piece. First up: the sketch done in blue pencil. It started out as a warm-up that I ended up liking enough to spend several days on. I scanned it in and inked it digitally in Clip Studio. I liked it well enough but I couldn’t resist the urge to do a full-scale pencil version. I love traditional pencil work. After scanning the pencils in I decided to do a little digital color work to further define the layers and interest points. While I’m not sure it was necessary and I think I prefer the pencils alone, I’ll post the color one here as well. I’ve added a few more images to the Otherscolours page so go check them out. There are three more from the prolific color artist, Amber Slate, who works exclusively with Prismacolor colored pencils. She gets such lovely, bright results and even makes me like one of my least favorites more after seeing her take on it. Thanks Amber. And please help me welcome a new name to the page with Jeremy Seaton. It looks like Jeremy is the first on the page to utilize some wet media in his version of Nyarlhathotep. It’s gratifying to see that the heavyweight paper these early prints were done on held up well to that and the effect Jeremy got is quite nice. Thanks for your brave approach, Jeremy. If you check out the pages above you will see that I have added a new one called Otherscolors that will feature the colorized versions of my work by some of the wonderful people that I have been honored to meet at cons or call friends in my day to day life. Each one spent hours applying their talents and creativity. It was very cool to see how they interpreted the pieces, their color choices and stylistic approaches. If any of you have your own colored versions that you would like added to the site, please contact me as I would love to continue updating the page with more work. After a very busy few months at the day job, I’ve realized how long it has been since i posted anything. I almost made it a steady 3 updates. Oh well. Know that I still love you. 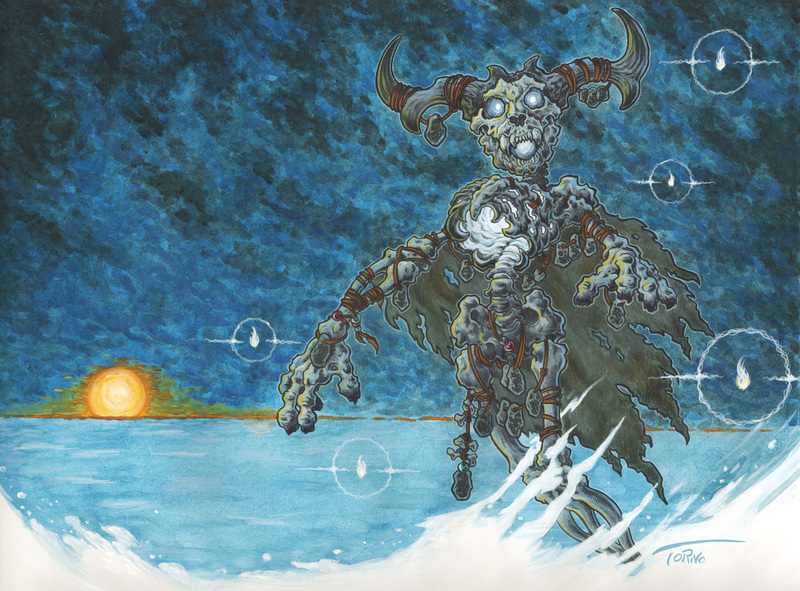 To prove it here are four more Lovecraftian gods and monsters. 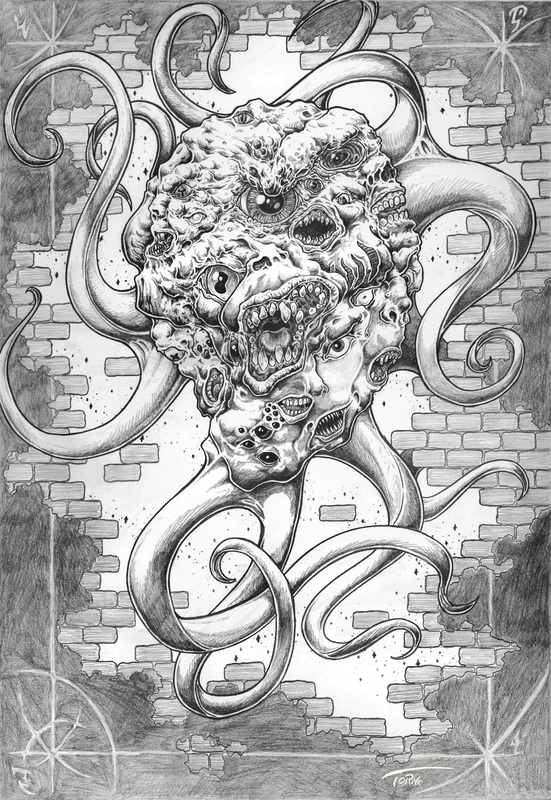 For the last 6 month or so what little time I’ve had between my day job, my family and designing t-shirts to make a little extra cash, I have been practicing my black & white skills by drawing Lovecraftian horrors. I had about 8 or 10 done when I started thinking about how much I would have loved to have them as coloring pages as a kid. 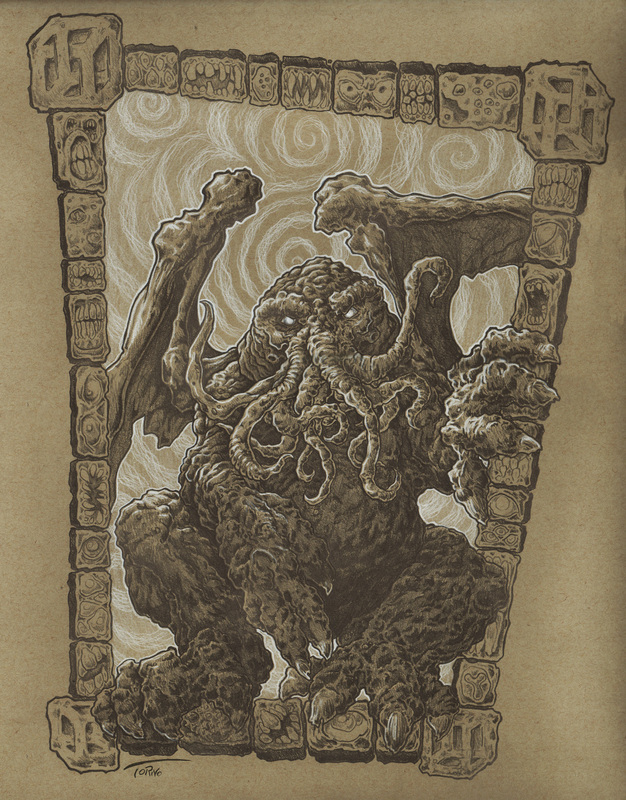 So even though coloring books are too trendy and I will be late (as usual) to that particular show, even though there is already plenty of Cthulhu on every horizon, even though there are already good Lovecraft Monster coloring books out there, I will be moving forward with these illustrations as a coloring book. a) Coloring is a great way to spend time. While it may be trending right now, I don’t think it deserves to die a natural death like most trends do. I know first hand how relaxing it can be to spend an hour or two at the end of the day getting lost in being creative and it shouldn’t be just for us fancy pants art types. Anyone can and should benefit from that and coloring, your own art or that of someone else, is as good a way to unwind as any. Way better, safer and cheaper than drugs. Again, first hand experience speaking. b) Lovecraft and Cthulhu may be wildly popular, in part due to public domain issues, but let me speak to my HPL street-cred. I have been reading his works since I was 9 and even knew what batrachian meant by the age of 11. That means about 37 years of reading (with dictionary at hand), visualizing, and drawing these beasties. Long before they were popular. Long before the vast majority of even the geek conglomerate were down with HPL. So I am an OG HPL, if I may be so bold. I am no expert but I am a long time dabbler. c) I love to see other artists interpretations of the various creatures. Lovecraft was so frequently vague in his descriptions that we have a lot of breathing room for our imagination. But my own style and interpretations are just as viable and I seem to get a very enthusiastic response from fans at conventions to my versions. In particular, I shared a dozen or so of these illustrations recently and had great response to the idea of them being presented in coloring book form. So now I am about 18 or 19 images in and committed to getting a quality coloring book out into a sea of others, probably to watch it swiftly disappear with a sense of mild satisfaction. For now here are a few more images from the project. It wouldn’t take a genius to figure out that I don’t update much. I draw and paint almost every day but taking the time to get it up on this site never sounds like my idea of how to spend my spare time. But I just spent a weekend with some great folks at Lilac City Comic Con and I’ve decided that I owe it to a couple of dozen of them to maintain this thing by throwing a few of the pieces i have completed up here every week or two. Maybe making it a habit will lead to it feeling less onerous. And I truly love those of you who do choose to spend a minute of your free interweb time looking at my doodles. In addition, since I am currently working up some black & white stuff with the intention of putting together a coloring book, I plan on creating a new page on here to showcase the amazing color work that some of you might do on those illustrations. Soon it could be your site in a way as well. So here are a few of those pieces to get us started. Some are re-works and some are brand new. For my next post I’ll explain a bit more about the coloring book (or should that be colouring book?). Have a great week. He is Hastur and he is unspeakable. So how, you may ask, did I find out about him. The answer, children, is by reading. (dramatic pause to allow revelation to sink in) He first appeared in Robert W. Chambers ‘the King in Yellow’ and later got several mentions by some guy named H.P. Lovecraft. Anyway, I wanted to draw some eyes and mouths and tentacles and such. I call this desire ‘Tuesday’ but it can happen any day of the week. So I did a sketch and then I blew it up and then I added more eyes and mouths and tentacles, because evolution. And then, while watching True Detective, I added the background so he would emerge from Carcosa with the black stars lighting the way for his triumphal entry past the bricks of our reality and into your home. Your welcome! If I find something exceptionally appealing about a sketches bony protuberances I will commit them to a cleaner going over. And if I really like them, and I need something real quick to fill up my display at a con, I will paint them. Someone bought the sketch at said con so I can’t show the complete progression, but lets just say it was even better than what you see here. 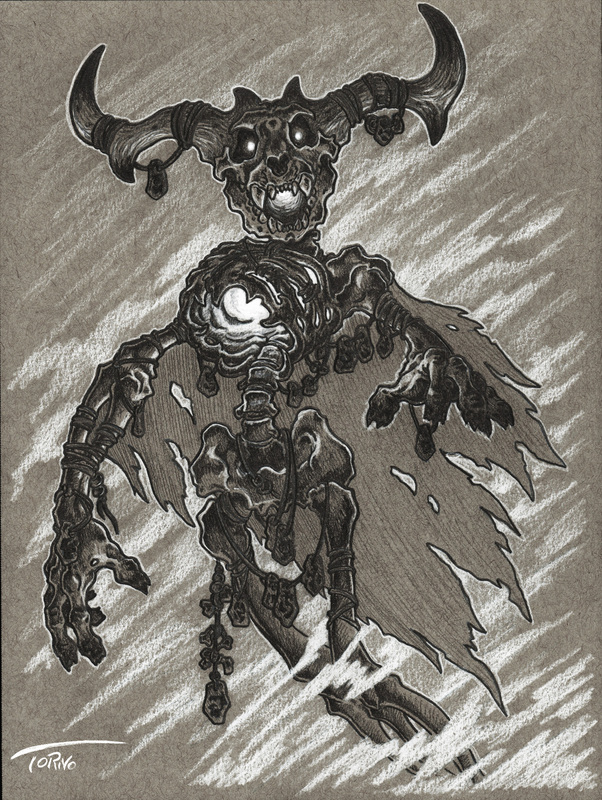 Anyway, this is a Wendigo, an ancient spirit of winter (frostburned fingertips), hunger and cannibalism (empty stomach and inward facing rib/teeth) and the wild (horns and animal skulls and all the other junk I wanted to draw anyway). He took just a few days work to go from the toned paper to color and if he is really well-behaved and time permits, he might get a digital cleanup. Or not. Sometimes I like my ancient spirits messy.